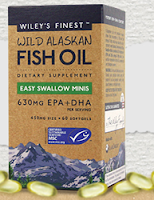 Right now you can get a FREE Wiley's Finest Fish Oil Easy Swallow Minis Sample! Fill out the form and we’ll send you a sample of our Easy Swallow Minis. They are 55% smaller than a regular 1000mg softgel, but provide 630mg of EPA + DHA per serving.